The title of this post certainly got your attention, didn’t it? Don’t worry — the topic of the post is not quite as bad as it sounds! The “hairy ball” theorem is in fact a mathematical theorem that states, in simple terms, that “you can’t comb a hairy ball flat without creating a cowlick,” a cowlick being an area of one’s hair where the directions “clash”, typically in a swirling pattern. The back of my head, with a swirling cowlick visible. I should note that it is quite tricky to photograph the back of one’s own head. I was reminded of the hairy ball theorem by a recent intriguing post by Steven Strogatz. The theorem applies to balls which are completely covered with hair, like a coconut — it is of course possible to comb human hair without a swirl, simply by making it a gigantic comb-over! 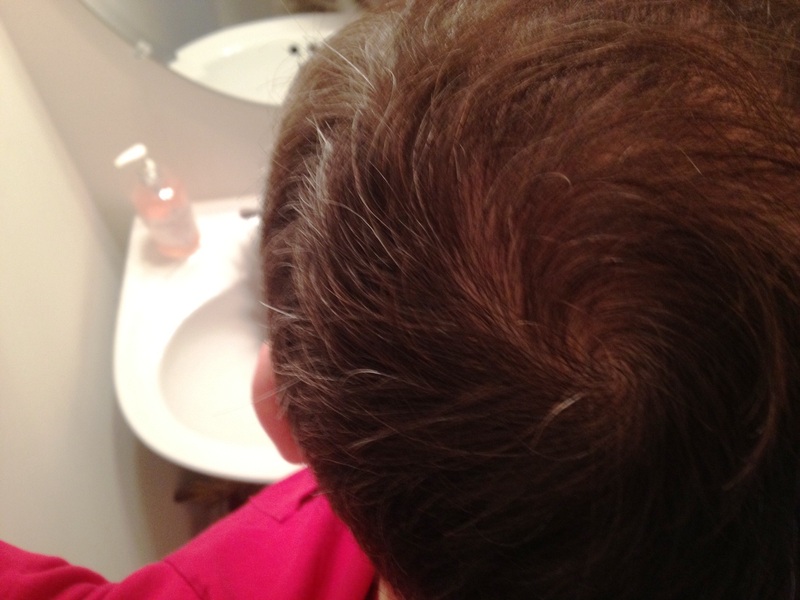 For a fully hairy ball, however, there must be at least one cowlick, and most likely two. For instance, suppose we try to comb a ball, starting at the top, away from a central point. 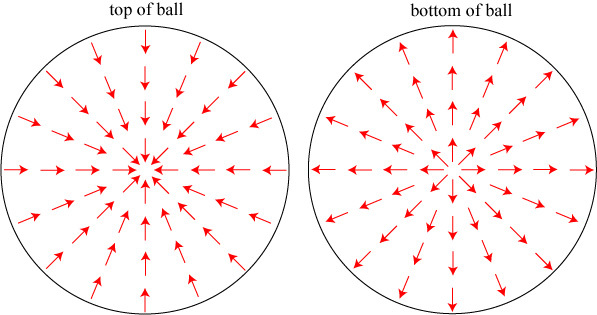 At the bottom of the ball, we will end up with an “inward cowlick”, where all the hairs converge (arrows indicate the direction the hairs point). We might instead try and comb the hair in a swirling pattern, which creates a cowlick at its origin at the top of the sphere and creates another at the bottom. The hairy ball theorem is a fascinating aspect of the subject of mathematics known as topology, which loosely speaking is concerned with the mathematical characterization of shapes. But hairy balls are of significance in other fields, as well: in fact, many optical scientists are unaware that a hairy ball is, in essence, right in their face every time they do experiments! It is hidden in the polarization of light, i.e. in light’s inherent transverse wave properties. In this post we will uncover this mysterious hairy ball of light. It has been known now for more than a century that light is an electromagnetic wave. When electric charges or currents are oscillated, such as in a radio antenna, they excite oscillating electric and magnetic fields, and these fields travel away from their source as a transverse wave. A transverse wave oscillates in a direction perpendicular to its direction of motion. If we were to take a “snapshot” of an electromagnetic wave at an instant of time, it might appear as illustrated below. Of course, we can’t actually “see” the electric field; we can only sense it. An electric field induces a force in an electrically-charged particle; an electron in the path of our beam of light would experience a force which rapidly alternates between pushing it up and down. This type of light wave, where the electric field vibrates along a straight line, is referred to as a state of linear polarization. 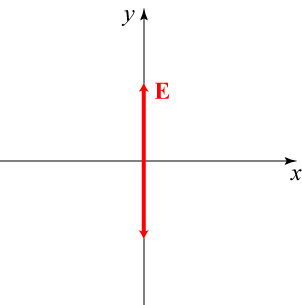 A beam does not have to be polarized along the vertical direction; it can be polarized along the horizontal direction or along any angle with respect to the x and y axes. It is also possible to create other states of polarization other than linear polarization; the other state of polarization that is particularly useful for optics experimenters is circular polarization. 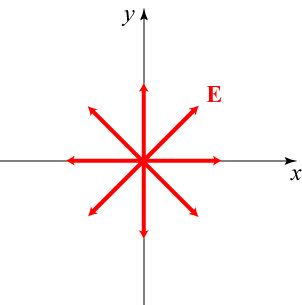 As the name suggests, in this case the electric field follows a circular path instead of vibrating back and forth. 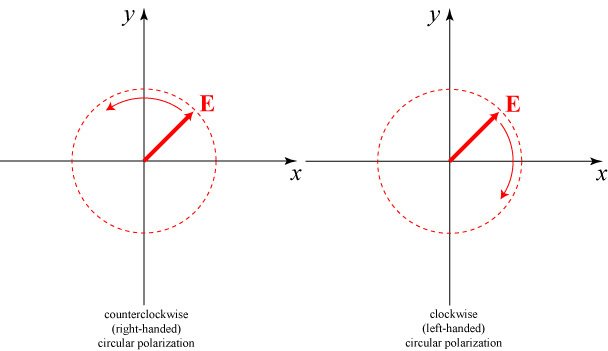 There are only two distinct types of circular polarization: counterclockwise (usually called right-handed) and clockwise (left-handed). It is also possible to create light with elliptical polarization, which in a sense is a middle ground between the extremes of linear and circular polarization. Like circular polarization, elliptical polarization can be right-handed or left-handed, and like linear polarization, the ellipse has a definite direction of orientation, indicated by the blue line above. This is the major axis of the ellipse, or the line that connects along the longest side of the ellipse. There is one important relationship between linear, circular, and elliptical polarization: elliptical polarization may be considered what happens when you “squash” the circle of circularly polarized light; furthermore, if you continue to squash the ellipse, you end up with linear polarization of the same orientation. It is worth noting that most light sources do not produce light with a definite state of polarization such as those discussed above. Instead, lightbulbs, LEDs, stars and the Sun produce unpolarized light which, loosely speaking, consists of a random combination of all polarizations. So how do we get polarized light? 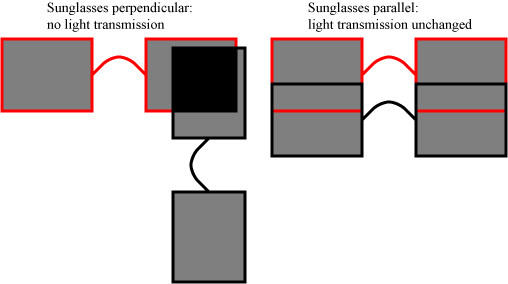 There are materials which will only pass light oscillating along a particular axis, appropriately called polarizers; the most familiar example of such polarizers are polarized sunglasses, which are designed to block light that is horizontally polarized and only allow light that is vertically polarized. 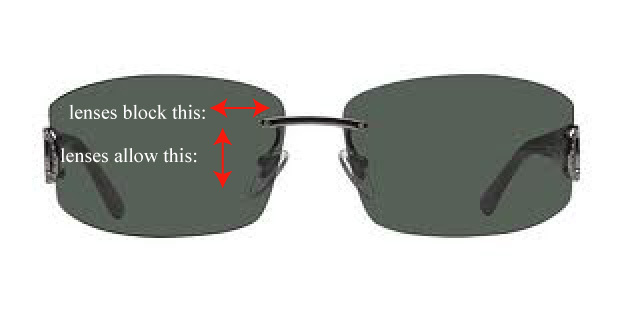 If you happen to have two pairs of these polarized sunglasses, you can demonstrate this effect: two pairs stacked up perpendicular to each other will block all polarizations of light and let essentially none through, while pairs stacked up parallel will not noticeably change the shading. More sophisticated optical elements can be used to transform linear polarization to circular or elliptical, and vice versa. In setting up experiments in optics, polarized light is typically preferred over unpolarized light, for reasons we won’t get into here. Henri Poincaré, c. 1913. Picture via Wikipedia. But this brings us back to the original question of this post: what does polarization have to do with “hairy balls”? 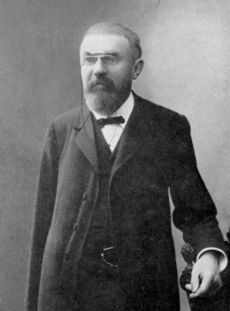 Way back in 1891, the brilliant physicist and mathematician Henri Poincaré noted** that it is possible to represent every polarization state as a unique position on a sphere, now known as the Poincaré sphere. The mathematical process involved is known as mapping; in a process somewhat similar to the way we can map the curved surface of the Earth onto a flat map, Poincaré noted that all possible polarization states (usually mathematically represented as positions in a flat plane) can be mapped to a sphere. 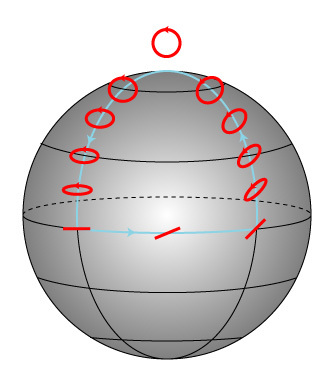 On this sphere, right- and left-circularly polarized light are situated on the North and South Poles, respectively, and every possible linear polarization state is located on the Equator. The states of elliptical polarization are distributed through the Northern and Southern hemispheres. 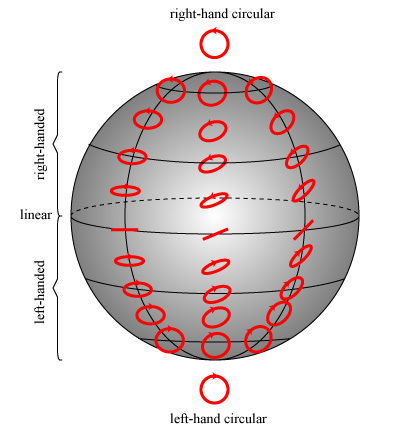 It should also be noted that, unlike elliptical and circular polarization, linear polarization doesn’t have a handedness; it therefore very naturally forms a boundary between the right-handed polarizations of the Northern hemisphere and the left-handed polarizations of the Southern hemisphere. So where is the hairy ball? If we replace the ellipses by their major axes, as we did above, and look at the sphere from the top, we see something like the picture below. The dashed lines (latitude lines) have been put into the figure for clarity. Traveling along any of these latitudes results in the direction of polarization slowly rotating in a continuous manner. 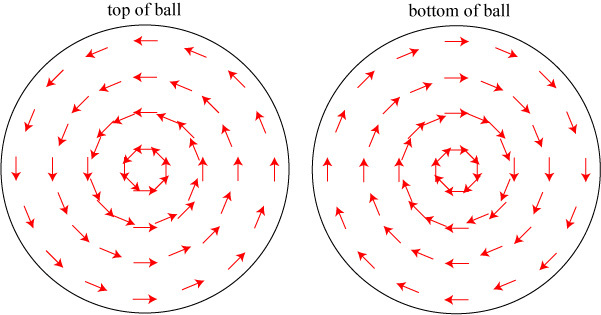 The direction is constant along any longitude line, however — and at the top of the sphere all the different directions of polarization collide at a point of circular polarization, which is the “cowlick” of the Poincaré sphere! Circularly polarized light has no “major axis”, as a circle has the same width in all directions. Circular polarization may in fact be viewed as a singularity in the direction of polarization, as I have discussed in a previous post. You will probably ask at this point: what good is all of this? What do we gain by looking at the Poincaré sphere that we do not have just by thinking of the polarization of light in a more conventional way? One use: the sphere is a great way to visualize changes in the polarization of light induced by a system of multiple optical components. 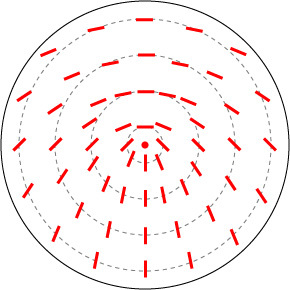 Every optical component that changes polarization may be viewed as movement around the Poincaré sphere. This may seem somewhat trivial, but in fact it is an important tool and also emphasizes the fact that changes in polarization are continuous. For instance, for light to go from linear to circular polarization it must go through a continuous chain of elliptical states. Another use: determining the so-called Pancharatnam-Berry phase of an optical system. This one is a bit more difficult to explain, so we’ll try and be brief. Suppose we start with a beam of light which is right circularly polarized, and we set up an optical system that first slowly changes the polarization to horizontal linear, then to 45° linear, and then back to right circular polarization. You might think that, if you were to compare the beam of light that suffered through this procedure with a beam of light that was simply left alone in the right circular polarization state to begin with, they would be identical — however, this is not quite true! The beam of light which had its polarization state changed will be found to have acquired a phase (effectively, a time delay) relative to the beam of light that was untouched. This anomalous phase is known as a geometric phase and can be directly related to the geometry of polarized light on the sphere. How much phase is acquired by a light beam in such a closed-circuit transformation? It will be equal to the surface area enclosed by the path on the surface of the sphere! For our example above, the area enclosed is 1/8th the area of the total sphere, or π/2. So we didn’t get any lewd pictures or dirty talk in this blog post, but we did hopefully learn a bit more about how the polarization of light works! Incidentally, although the hairy ball theorem was proven in 1912 by the Dutch mathematician Luitzen Egbertus Jan Brouwer, it was first stated in the late 19th century by… Henri Poincaré! I have not delved deep enough into the history to determine if Poincaré had hairy balls on his mind when he formulated his discussion of the polarization sphere, but it seems a distinct possibility. ** In his introduction to the sphere, Poincaré credits a “M. Mallard”, though it is not clear whether Mallard is the originator of the sphere description, or just inspired it. 2 Responses to “Hairy balls” in optics? I see that you got some use from that representation. What if instead you simply looked at every unit vector starting at the origin, and considered that as the axis of rotation. You can generate a circle around it. When you look at the projection from the top, you see all the circles and ellipses that you’d draw to represent polarizations. Pick an axis A and a time t, (cos t, sinA) gives a quarternion, and if you multiply that by A you get a quaternion inline with A whose vector part is proportional to the height of the wave at time t. The same quaternion, multiplied by B that is perpendicular to A, gives you the rotation of B at time t, and the projection from the top gives you the direction and amplitude of that wave at time t. All assuming a unit wavelength. For another wavelength, adjust t.
The obvious difference between this model and Poincare’s is that it includes the negative of each rotation, while Poincare’s model throws away half of them so that only the poles have two versions, the north and south poles and nothing else. My version does not have a cowlick because each hair stands straight. Linear polarized light is the sum of two waves that are linearly polarized on the same axis and are 180 degrees out of phase. Everything else is the sum of two waves that are each linearly polarized but differ by axis or phase or both. I don’t see any singularities here, it all goes smooth. You have some useful results from Poincare’s model, could there be any value in this other model also?